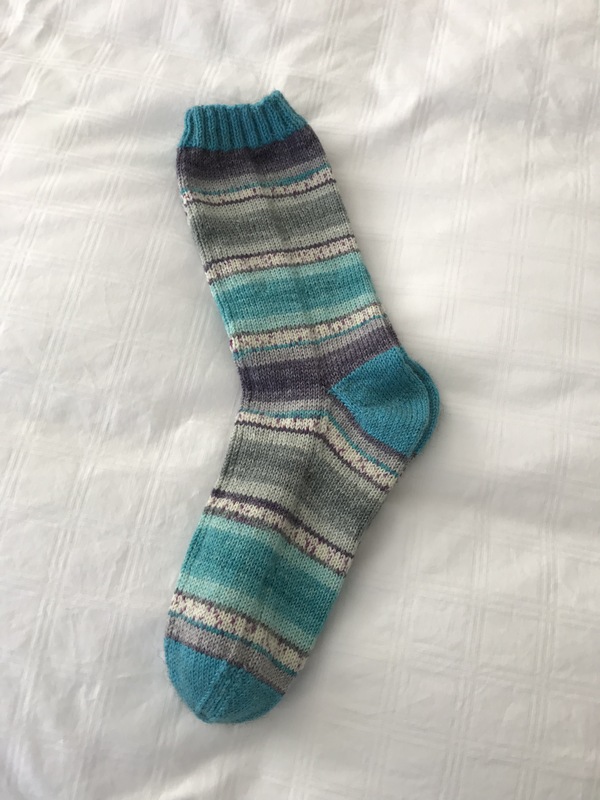 I started these socks two weeks ago. I decided to begin using yarn leftover from other socks – I have a basket full of balls large enough, when combined, to make a pair. I selected two yarns I thought might blend reasonably well and began knitting by alternating the yarns – the effect is an overall colour progression in alternating rows. Here’s how I do it: To start, I knit three needles using the first yarn, then go back to the first needle and knit two needles of the second yarn. After that, I continue knitting two needles of one yarn, then two needles of the second yarn – the second yarn is always one needle behind the first which means I never have to worry about crossing the yarns and I get a continuous smooth alternating spiral. 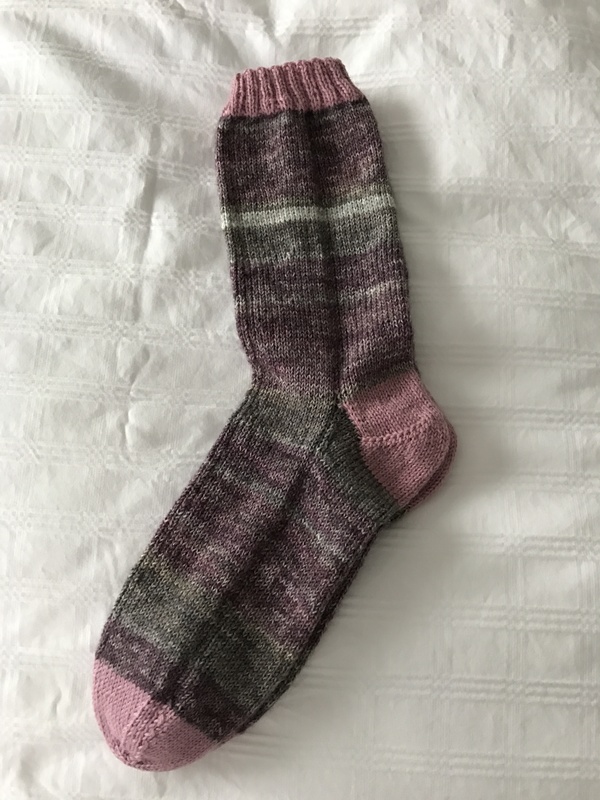 What’s interesting about this pair of socks is that while I was able to match the start point on one of the yarns, the colour changes on the other were too subtle to worry about but it turns out the yarns were in synch and both socks knit up with essentially the same pattern! That was a lucky outcome, I didn’t expect that to happen. The areas of dark and turquoise matched up pretty well. 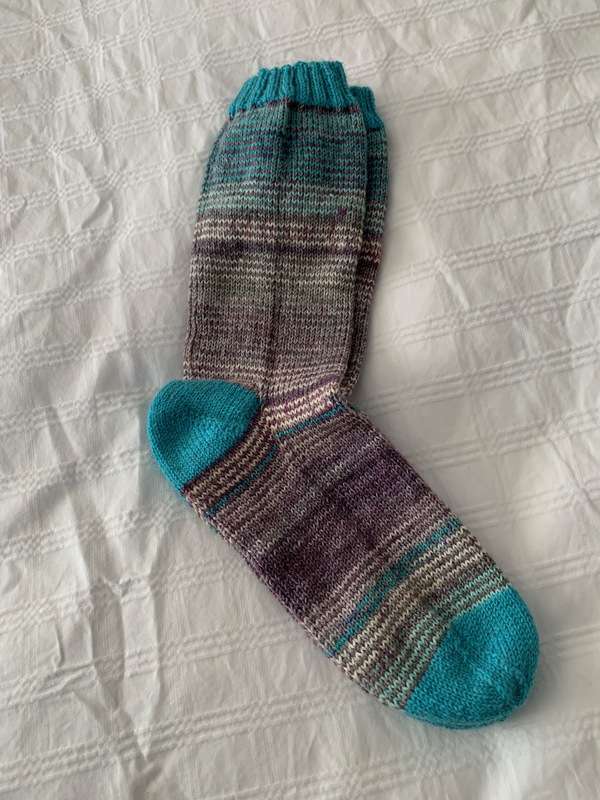 Here are the original socks made from these two yarns. The yarns combined to produce something quite different yet interesting. I’m now working on another pair amalgamating two yarns – I have enough leftover yarn to keep me going for many months!